Usually when I think of pumpkins, the Butternut pumpkin comes immediately to mind. An hourglass-shaped pumpkin which makes for a decidedly tasty and wintery soup, paired with condiments like fried bacon, chopped parsley or even an indulgent little drizzle of pure cream. If not reserved for soup, it’s puree can be transformed into scones, muffins and spiced pumpkin pie (though the latter is not very prevalent here in Australia). It is also great cut into wedges (leave the skin on, it actually has a really nice flavour, once roasted), tossed in olive oil and spices, roasted until tender, and served as a side dish (Jamie Oliver has a good recipe for this). The Queensland Blue and Jarrahdale, two regional varieties of pumpkin you also see frequently in the shops here, remind me more of the pumpkin my sister and I once carved for Halloween. Carved pumpkins are meant to ward off evil spirits, but ours seemed to attract a few pests and after a couple of days, I was starting to get creeped out by the rot and mould that had set in, making the facial features sag. 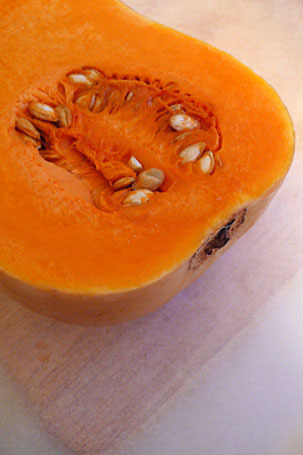 When not being taken to with a knife for such artistic endeavours, all types of pumpkins are high in Vitamins A and B, and their seeds contain a lot of Zinc, which is good for the prostate and the immune system. And here’s an interesting little bit of trivia that I also learnt from Wikipedia : apparently, you can roughly guess the number of seeds contained in a pumpkin by multiplying the number of fruiting sections by 16! This pumpkin salad, from a recent issue of Gourmet Traveller is, in my opinion, an absolute winner. I like it served warm, as befitting the current weather, and don’t stinge on the tahini sauce – generous lashings of it really make the salad. Combine chickpeas, cinnamon and onion in a large saucepan, cover with water and bring to boil, simmer for 20-30 minutes or until tender. Drain and discard cinnamon and onion. Preheat oven to 220’C. Place pumpkin in a roasting pan, season with sea salt, drizzle with oil, scatter with allspice and toss to combine. Roast, turning occasionally, for 25-30 minutes until golden and tender. For the tahini sauce, place tahini in a bowl and slowly stir in 90ml cold water, then whisk in remaining ingredients and season with sea salt. Makes about 250ml. Sauce will keep refrigerated in an airtight container for up to 2 weeks. 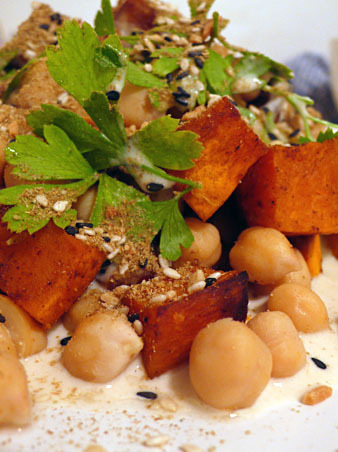 Gently combine pumpkin, chickpeas, parsley and Dukkah in a bowl and season to taste. Spread 1/4 cup tahini sauce over a plate, top with salad, drizzel with an extra 2 tablespoons tahini sauce and serve. Aw, thanks for the plug, Y! And thanks for this fabulous recipe. Honestly, I adore all of the ingredients in this recipe, especially the cinnamon and tahini. Oh, I’m awaiting the winter as we speak! Thanks for a truly delicious WHB entry. Hi, I’ll definitely try this out and a good way of using up the dukkah. Dukkah is Egyptian but has almost become Australian, isn’t it? Thanks. Ceviz : It certainly has! Especially with the inclusion of wattleseed or macadamia nuts in the mix (I’ve seen such “Australian” flavoured Dukkahs around). Sounds very yummy. In the U.S. this is called butternut squash, so when I first started reading blogs from other places I was always confused when they said pumpkin. I haven’t tasted Dukkah, but I want to try it! And I love tahini so I’m guessing this would be a big hit with me.